The copper plaque on the rock reads: "This garden is dedicated to the Senior Citizens of East Orange in recognition of and appreciation for their contribution to the growth and development of our city. May 31, 1962." I attended the May meeting of the Historical Society of East Orange, Inc (5/11/10) and found out that the President, Goldie Burbage and the Chaplin, Rev. Lancie Marchan, had visited the area a few days before the meeting. While there, they had planted a row of Dusty Millers along the back wooden edge of the cordoned area, and some Impatiens around the back of the memorial rock in a horseshoe pattern. When I visited the garden immediately after the meeting, I took the above photograph. I could see that the plants were already beginning to dry out and wither from lack of moisture. There was no mulch to hold water in the soil around the plants, and the soil was very dry and sandy to begin with. On the 12th and 13thy of May we had rain showers, so I did not get back to the garden until Friday, the 14th of May. In spite of the rain, the Impatiens had withered further and the soil was still dry and dusty. I applied a bark mulch all around the rock and between the Dusty Millers. I planted some experimental Marigolds, which ought to be able to take the full sun and poor soil conditions. Then I watered the area to see how well the mulch would retain moisture. I also promised myself to visit the garden at least every two days (except when it rained). On Saturday, May 15th, I showed the garden to my helper, Al-Quadir Marsh, and he decided to make the garden part of his high school community service project. Together we cleaned the area (it needs to be cleaned of trash daily) and he did the watering for me. On Sunday, May 16th, we found that some of the flower heads had been knocked off (or bitten off) the small Marigolds, so Al-Quadir planted some larger Marigolds to see if they would do any better. One of the small Marigolds had been completely uprooted, apparently by a squirrel or some other animal, so we decided to plant only three large Marigolds and observe them over the next few days. The small Marigolds continued to lose their heads over the next week, but I also noticed that the Dusty Millers, while they may be deer resistant, are apparently a delicacy to some rodents in the area. As an experiment, on May 21, I dug a Hosta from my own garden and planted it in the middle of the Dusty Miller row to see if it would become a snack, or survive and grow. Meanwhile, the large Marigolds were untouched, and some of the original Impatiens had begun to regrow. 5/25/10 The regular cleaning and watering is paying off. The regular cleaning seems to be affecting the people who have been littering and crushing out their cigarettes and leaving the filters behind. If they see the place as a junkyard, they feel less guilt about adding more junk to it; but if it is kept clean, their litter makes them stand out and they feel guilty about it. At least that's my theory. The regular watering and the retention of moisture in the soil by the bark mulch brought forth one little Impatiens flower, and I can see growth in several of the other Impatiens I thought had withered away. The Dusty Millers also seem to be recovering. Tomorrow I will bring some new plants and try to get the garden ready for the Memorial Day weekend. 5/26/10 The weather report predicts thunderstorms tonight, but it has been very hot and dry all day, so I visited the Senior Garden this evening and planted two orange colored Marigolds, two violet striped Petunias for a bit of color, four Petunias with a new color for this year... Appleblossom (pink). I also planted two blue Heavenly Blue Morning Glory vines at the base of the sign, and a surprise plant at the base of the sign in back of it. 5/31/10 Al-Quadir and I got up early to decorate the Senior Garden for Memorial Day and give it extra water for the 90 degree temperatures expected. I am dedicating the Marigolds to my Mother (who taught me to save the seeds inside each blossom), the striped Petunias to my Step-Mother (who loved striped flowers), and the Tomato Plant to Charles Perry, a.k.a Wiz Kid Supreme (who loved to eat). If you would like to dedicate your plants and have the names of those you want remembered published here, you have only to identify the plants and make the request by e-mail. Please keep in mind this is NOT my private garden, although I have taken it on as a personal responsibility for the time being. 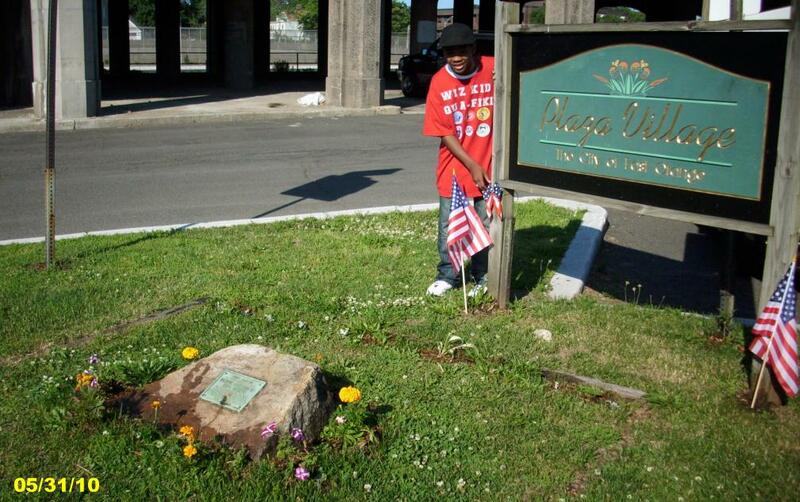 This is a PUBLIC garden on PUBLIC property and it was dedicated to SENIOR CITIZENS of EAST ORANGE in 1962. I feel that any East Orange Senior Citizen ought to be able to bring a plant or two to contribute to the garden. You don't need my permission, but if you want my help, contact me at eohistorical@yahoo.com and I will arrange to meet you there with my gardening equipment (such as it is) and help you with your planting. When selecting plants, keep in mind that the soil is dry and sandy and the site is in full sun almost all day long, but wood bark mulch works to keep the roots moist. I usually visit the site to water it between 6:00 and 6:30 PM each day that it doesn't rain. July 4th, 2010. The town had its celebration on 7/2/10 this year, but I cleaned up the garden and redecorated it for the real anniversary of America's Independence. The barren grass is compliments of whomever whacks the weeds and mows the grass at City Hall Plaza. It's cut much too short to survive the heat of summer. I don't have enough water to keep the entire lawn going, but so far the flowers have been left alone by the mysterious weed whacker and they are thriving. It is expected to reach 90 degrees today, so I gave the flowers and vegetables an early morning watering. The garden made it through the summer! The photo above, taken on Labor day (9/6/10) shows lush green grass, a couple of green tomatoes waiting to ripen, most of the original flowers still growing and blossoming (plus a couple of new Chrysanthemum bushes for the Fall). There are still no blossoms on the Morning Glory plants that are growing up the sides of the Plaza Village sign, but they look very healthy otherwise. Adding to my Labors recently, I found two new monuments on the same block behind City Hall at the corner of North Arlington Avenue and New Street. The monument shown above is called The Centennial Tree, and contains a marker dedicated to Clara Maass. 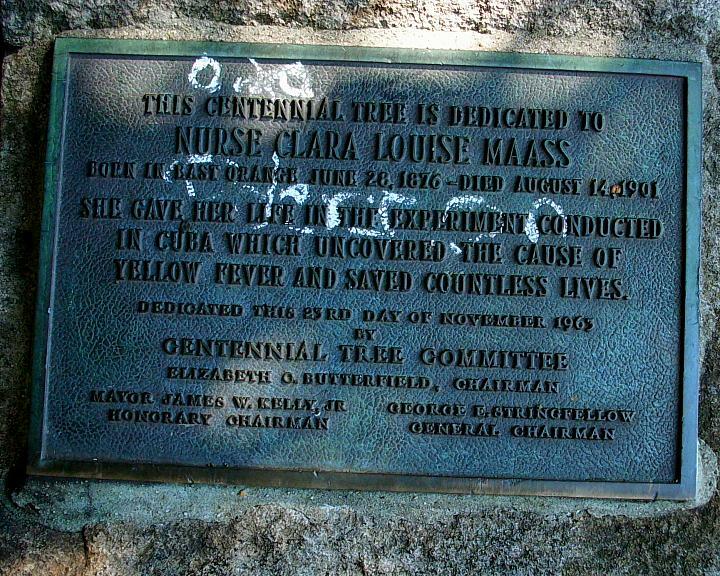 The Inscription reads: "This Centennial Tree is dedicated to Nurse Clara Louise Maass, born in East Orange June 28, 1876 - died August 14, 1901. She gave her life in the experiment conducted in Cuba which uncovered the cause of Yellow Fever and saved countless lives. Dedicated this 23rd day of November, 1963 by Centennial Tree Committee. Elizabeth O. Butterfield, Chairman, Mayor James W. Kelly, Jr Honorary Chairman, George E. Stringfellow, General Chairman." This photo shows the full beauty of the old Centennial Tree, but it is in need of some pruning in the upper branches. The local loiterers from the Laundromat on the adjacent corner have nothing better to do than throw bottles and trash behind the hedges, so it needs regular cleaning as well. The trunk of the tree has been a favorite place to carve initials and love messages over the years. The monument is directly opposite from Cicely Tyson Elementary School, so perhaps the students and teachers can help take care of it as a Civic or Community Service Project. 11/4/2012 - Sad news to report. My old friend, the Centennial tree, is gone. Apparently the blight in its upper branches (see photos above) was too much for it, and some time between 2010 and today, down it came. It does not appear to have anyone interested in replacing it. I am no longer able to travel to City Hall on a regular basis, so someone younger will have to take up the cause of replacing the tree. The other monument is in front of the Public Health Building, which you can see behind the Centennial Tree on New Street. It is inscribed: "In Memory of Mary Dudley Hussey, MD, LLD. Born July 31, 1853, Died October 24, 1923. Devoted to Peace, Humanity, and Nature. 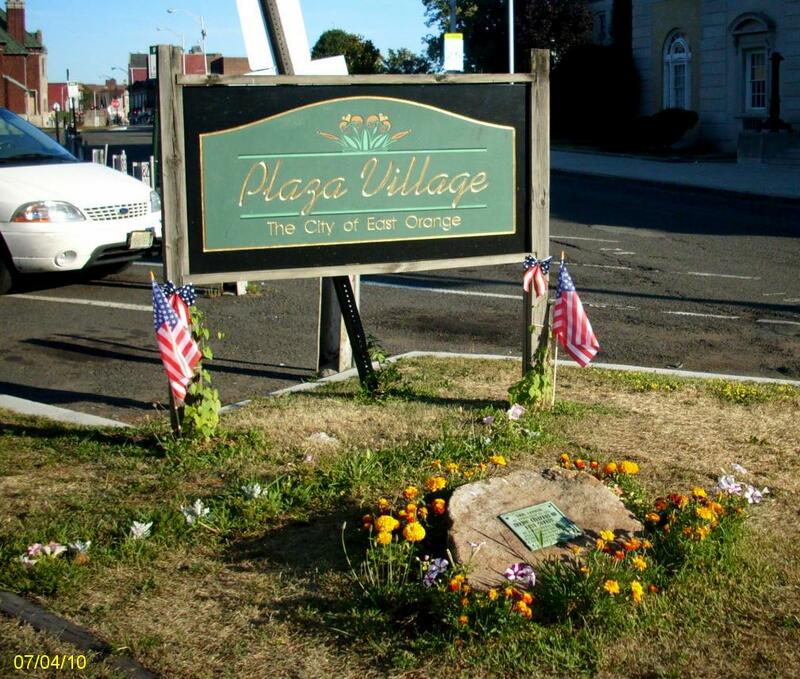 A grateful tribute from the East Orange Garden Club 1932." I wish East Orange still had a garden club. I could use the help! As of November, 2010, I no longer have a car so I will have to let others take care of the Senior Garden, Centennial Tree Garden and the Public Health monument... if they will. Instead, I will be taking on a project within walking distance of my home: The Clock Garden.